You are browsing the archive for 2008 June. The newspaper “pocket” cartoonist is a rare but hardy breed, says PCO Chairman Andy Davey. Spare a thought for the humble pocket cartoonist, guv? Be warned – you’ll need your field glasses to catch them. The Guardian has not replaced David Austin who died in in 2005. But even though they are a diminishing species due to this loss of habitat, there are several individuals in the field still visible. Pugh (The Times), Banx (Financial Times) and the untouchable Matt (Daily Telegraph) are all still going strong. Pocket cartoons are still a pretty stout mainstay of British broadsheet front pages. And Matt is the only cartoonist to routinely get a name check during the newspaper round-up on Radio Four’s Today programme. An Independent Line, a collection of cartoons from The Independent from the last fifteen years, now on show at the Political Cartoon Gallery, shows the work of one of the finest of the current dwindling crop – Tim Sanders. Purely in terms of wall space and press coverage, Tim is drowned by his brothers-in-ink, Dave Brown and Peter Schrank. But as an observer of current social trends, he’s up there with the best. Osbert Lancaster is often credited with establishing the format in UK newspapers, and a rich array of talent in the form of Mark Boxer and Mel Calman (whose work can still be seen on greetings cards) and others emerged in his wake. Pocket gags are a slice of social history; you can gauge the feel of any era by looking at the pocket cartoons. To set the scene, define the characters and make a gag about current social or political trends is no mean feat in a single newspaper column, so hats off all round, please laydeezangennemen. An Independent Line is at London’s Political Cartoon Gallery until October 18. 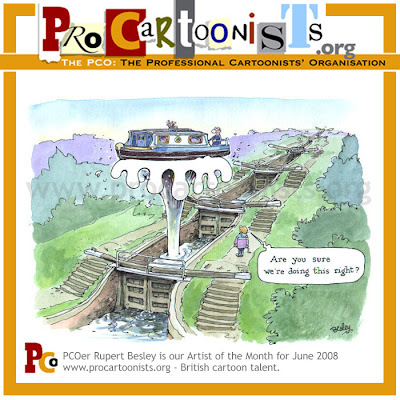 Cartoonist Rupert Besley is the PCO artist for June. Click the image to enlarge. You can see Rupert’s other Artist of the Month images by clicking his name, under “Labels” below. And don’t forget to click B for Besley. A free exhibition called The Art of Dr. Seuss is at the Croydon Clocktower, Croydon, South London, from June 28 until September 20. The books of Dr. Seuss, such as The Cat in the Hat, have been popular for more than 50 years with their combination of zany pictures and rhymes. However, few of us are aware of the “secret art” that Dr Seuss, aka Theodor Geisel, rarely exhibited during his lifetime. As well as cartoons, the show at the Croydon Clocktower, part of the Museum of Croydon, features prints, poetry, advertisements, magazine cover designs and even “unorthodox taxidermy” sculpture. There will also be a range of activities for all fans of Dr. Seuss’s literary gymnastics, both young and old, inclusing storytelling sessions and an opportunity to meet the Cat in the Hat! The Croydon Clocktower is in Katharine Street, Croydon, CR9 1ET. Opening hours Monday to Saturday 11am-5pm. Entrance to most workshops is free but will be ticketed on a first come, first served basis as places are limited. For more information, go to the Croydon Clocktower website. 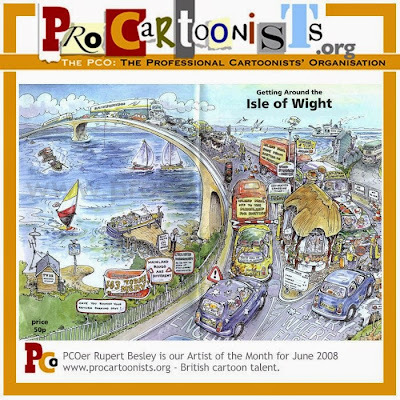 Cartoonist Rupert Besley, the PCO artist for June has a history of producing large colourful cartoons on travel and tourism. Bloghorn says click B for Besley. Click to enlarge the image. An exhibition of Gerald Scarfe tennis cartoons and caricatures of former Wimbledon champions has opened in time for the 2008 championships. Scarfe and the drawings get a look in about 2 minutes into the report which is from Channel 4 News. 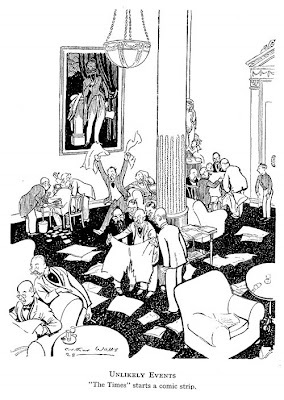 This 1930s Punch cartoon will make current Times readers chuckle, as a full-colour comic strip now appears in the paper every Monday. 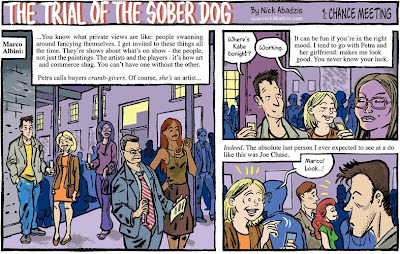 The Trial of the Sober Dog by Nick Abadzis, a serialised graphic novel, is now in its third week. It appears in the T2 section of the paper. It doesn’t appear to be on the Times website yet, but you can catch up at Nick Abadzis’s blog. 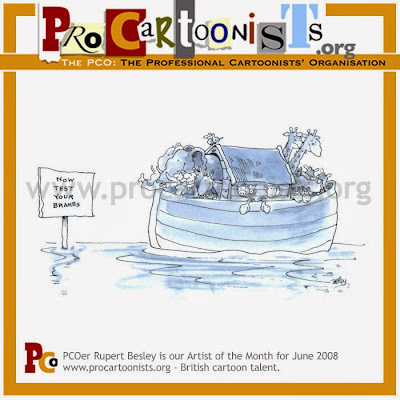 Our second offering from the PCO Artist of the month for June, PCOer Rupert Besley. 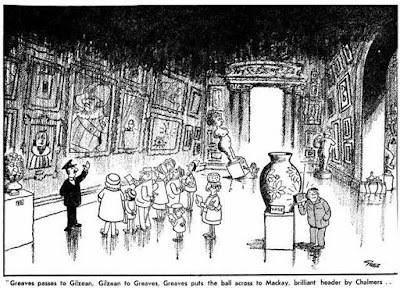 A Giles cartoon published in the Sunday Express in 1967. The question “What is culture?” was raised recently in a high-profile promo campaign for the BBC’s re-launched Culture Show. An exhibition of cartoons from the 20th Century that takes a light-hearted look at culture may provide the answer. Or it might just be a good laugh. Culture Cartooned is at the Royal Museum and Art Gallery in Canterbury until Saturday 26 July and includes original artwork and prints across a range of cultural themes, from the visual arts, ballet and cinema to sport and the Olympics. This is the broad variety of activity that comes under the government’s definition of “culture”. Exhibition highlights include cartoons by Giles about Arts Council grants and sporting prowess; perceptive observations of museum and gallery visitors by WK Haselden and Keith Waite; Reg Smythe’s Andy Capp commenting on films; and the pocket cartoons of Mel Calman and David Austin. Some of the cartoons question what we mean by heritage, while others show our ambivalent attitudes to sport and sportsmen, or art and artists. The show is at the Royal Museum and Art Gallery, Beaney Institute (first floor), 18 High Street, Canterbury. It is open Monday to Saturday from 10am to 4.45pm. Admission is free. Culture Cartooned is organised by Canterbury City Council in partnership with the British Cartoon Archive at the University of Kent. On the subject of the Culture Show, the extended version, screened on Friday night, included a great animated film by Johnny Kelly which will be of interest to cartoonists and anyone involved in any creative endeavour, as it’s called Procrastination. Following our recent post about the variety of lines and ways to make a joke you can find inside the PCO cartoonist portfolios, here’s a classic piece of linear observation by the great American director, Chuck Jones. The dot and the line was adapted from a book by US architect, Norton Juster. The original illustrations for Juster’s book were made by New York cartoonist, Jules Feiffer.